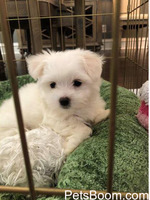 lovely maltese puppies - Find pets for sale on PetsBoom.com | Global free classified ads. Peanut is so outgoing and fun loving. Never a dull moment with him. He will be small as an adult between 4 to 5 lbs.